Its been more than 3 weeks ago since my last entry made in that cybercafe next to my hotel in Taipei. When I was in Taiwan then, life in Muscat seemed to be unreal and like a dream. Now that I am back in Muscat, those weeks spend in Taiwan seemed unreal and like a dream as well. Events after events conspired to keep me from further entry here. We came back to Muscat minus our luggage. That was the first time we got separated from the luggage and that was a horrendous experience. 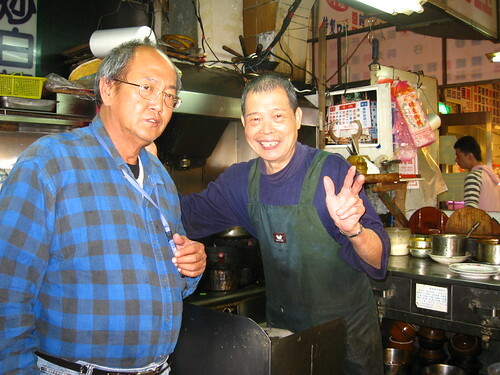 I had so many irreplaceable stuff in the luggage such as that two state of art handcrafted rod/reel for Riamfada , special 'unbreakable' swivel joints and Hawaiian clasps, and lots of special Taiwanese/Chinese food and spices. I like good blades. You recalled Tinkerbell regalia had this William Henry folder blade bought largely for her. I came back with 3 good blades including a Buck folder , a Japanese handcrafted tanto and a Schrade survival folder. That Buck will be dedicated to Riamfada and always in her fanny pack. We got back into Muscat on 1 Apr 6am instead of 31 Mar 11pm. That day was spend in retrieving the kitties in morning followed by Riamfada the next day. And in making complains and phonecalls to check where the baggage could have been. It was with great relief the baggage rejoined us 2 days later. You can see the work of art rod/reel and the blades in this Flickr folder. I felt somewhat like a vandal when I had to transform that rod/reel to make it a suitable perch as well for Riamfada in wrapping twine around the rod. I had to make that uneven and with bumps for Riamfada. So look at the photo before and after. The 2nd rod/reel is even more a work of art and photos will be taken of that later. I have said Tinkerbell was a superb flier. I mentioned in Rhapsody in Spring of Tink parroty joke played out on the cross road. She was on the perch facing us. The lights changed and I accelerate the bike to cross. When she hovered , and stayed above her perch, she was hovering backwards in pace with the bike. That was through the initial accelaration , and then when I jammed on the brakes to a halt, she hovered and maintained her position to the bike/us amd hovering backwards all the time. I panicked and my wife panicked and pulled her down on her line ending that parroty joke she played on us. It was raining and wet much of that time we were in Taipei. Earlier plans to go with friends had to be altered. 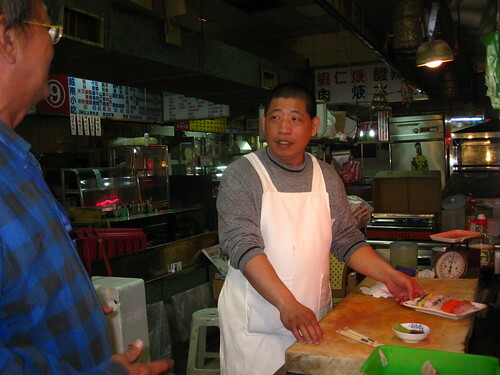 In the few days we had in Taipeh, we visited places. Since Taipei Zoo was given a pair of giant panda from Beijing with the thawing of relationships, we had to visit the zoo. The zoo was so different from the zoo that I known earlier and disliked then when the animals were kept in cages. The zoo was transformed into a place for the creatures , build with imagination for the creatures replicating the natural habitat that they came from. It was a delightful place to spend time in. 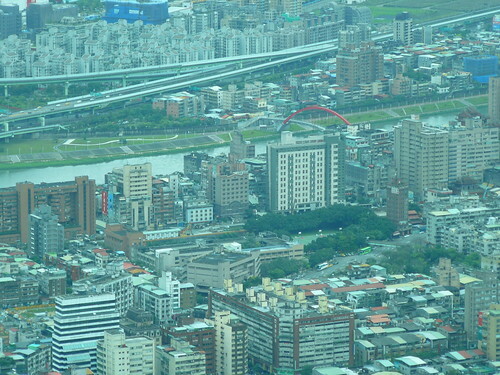 Our usual hotel in center of photo next to the white 4 storey building. This will be clearly highlighted if you click on the photo to go to the flickr page. In our last evening there, my good friend C.H. came in evening to present us with good Taiwan tea and tea set for us to take back to Oman. He thought of joining us for dinner nearby with us before he returned to his office, but we had thought of going somewhere else for dinner instead. Perhaps I should have told him where and he might have came with us. On 2 April Thursday (our Saturday here), we went to Jessica to take back Riamfada. Jessica told us she and her family enjoyed Riamfada very much. Riam was very nice to her kids, and even got the affection of her hubby who was a bit fearful of her that first time they got her. We told Jessica she and her family will always be welcomed at our house and that we would all go out one of these weekends. Life resumed for us in Muscat. The luggage came on 3 April and the rod/reel adjusted for Riamfada. 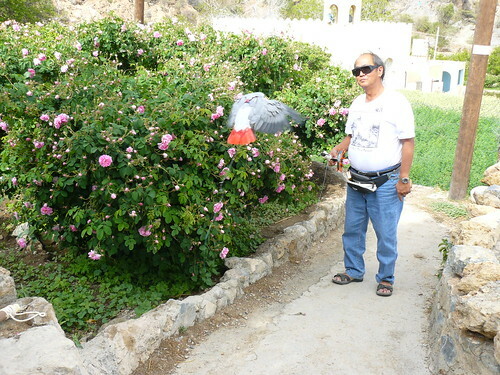 My wife read of roses blooming in this mountain village on top of Jebel Akhdar (Green Mountain). I was always for smelling roses and the three of us went there. Kitties could not come and villages would have their own kitties. You will notice me in the new setup. Two carabiners on the fanny pack, one one each side of me. The hand perch was now corded and hang on one side. The rod/reel hung on the other side of me. The rod/reel made it so much easier to release the line as well as to retrieve the line and act as a perch for Riamfada as well. I came back to a period of intense work in the office. That also involved in trips and overnight stays to my project in Duqm, about 600 km south of Muscat. So much so that I had not the energy to do updates the last 3 weeks. There were always time to do those neighbourhood walks with Riam and the kitties. The kitties always waited around the door and when I eventually took Riam out of her room, they would rush to the garden gate and waited for us to open the door to rush out. I find that very strange as they would go out anyway without us. But going for neighbourhood walks became a ritual for the kitties. I added more perches hung from Dyneema lines crossing the patio. When we got back from the walks, Riamfada and I would hang out in the patio. With a pitcher of ice fruit juice and my book. Riam would be on her perches and after a while, she would make her way to my shoulder for head rubs. Summer came onto us. With temperature in mid 30s approaching 40s. Wadi trips would be less in such temperature. More trips would be made up to mountains where it was cooler. 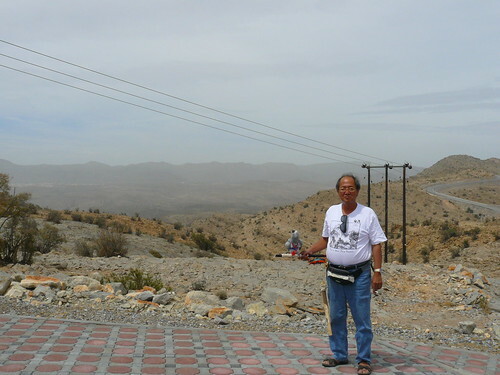 Such as weekend 10 April where we went to Jebel Shams. My wife had not uploaded those photos yet. That was another beautiful place to be with sheer drop of hundreds of meters on the broken off side of the mountain. And the last weekend of 17 April, we had a local visitor with his sister who thought of getting a parrot. We got to know him in Omanforum and he accepted our invitation to meet that day. After that, we went up to Jebel Akhbar again. This time to a delightful picnic ground that we discovered there two weeks ago. To spend the afternoon in coolness of 2000 meters, to read, to laze until time to go down again. Remember a while back where Riamfada bit me thinking my hand was my wife's hand? The opposite happened. A few days ago, Riam was in the living room with me when I cam back for lunch. She snuggled to me on my lap enjoying her head rubs. Her eyes were half closed with pleasure as I rubbed her head with her periodically rubbing her beak on my finger still with her eyes closed/half closed. My wife was sitting next to me. I withdrew my hand from Riamfada's head and told my wife to stroke her head just as I did. Riamfada enjoyed that, and then she froze and looked up to see my wife finger. Riam gave my wife the evil eye and my wife withdrew her hand. I thought that was enough. Then I could almost feel Riamfada brooding and brooding and getting indignant that she was molested by my wife pretending she was me. In a flurry of wing beats, she flew to my wife and wanted to bite her. I shouted to her to stop, and got her off with step up to the perch. I told her that was very bad and I was the one who told my wife to do that hoping for better relationship. That if she want to attack , she should attack me. I placed my finger in her mouth to have her whimpering at me. I told her attack on my wife must not be done and for the first time, I took her to her cage in her room and shut her in her cage and I went to office. She was normally taken back to her room when I left for work after lunch. She was taken out by me after work. She remained cool to my wife. No further attempts were made to attack my wife. We went for neighbourhood walks. Neighbourhood walks always involved in flights. One mode involved my wife. She would step on the hand perch hold by my wife and I walked 20-30 meters away releasing line. Then recall was made for her to fly to me. She seemed to have forgotten that attack on my wife, or forgiven my wife.